A long, long time ago, before email and texting, the mail was delivered in a much slower way-it was called Snail Mail (because some thought it was delivered by a snail). Although it took much longer, everyone agreed that letters were a little more special when they were delivered by Snail Mail. They might be handwritten. They might include a drawing. They might even contain a surprise inside! 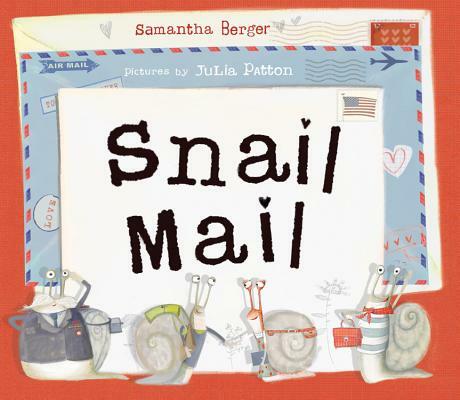 One such letter was sent by a Girl to the Boy she loved, and it was up to four special snails to deliver her card across the country. The snails trek across the country-through desert heat and dangerous blizzards, across mountains and plains, through cities and forests-and along the way, they find that taking time to slow down and look around makes the journey all the more beautiful. Snail Mail's playful and educational story encourages kids to have slow living, and to approach life with determination and wonder. Julia Patton's rich illustrations showcase America's diverse terrain and national monuments from coast to coast. Kids and parents alike will delight in this celebration of America's beauty and the power of a simple handwritten letter. Samantha Berger loves getting handwritten mail, and love writing back. She has driven across America in thirty-six days and flown across in five hours (she can never believe this). Samantha is the award-winning author of Crankenstein, Snoozefest, Martha Doesn't Say Sorry, and more than eighty books for children. She also writes cartoons, commercials, and comics, and performs voice-overs. She loves traveling the world, making new friends and staying in touch with them by writing letters. She splits her time between New York City and sunny California, where she lives with her rescued dingo-chihuahua dog, Polly Pocket. Julia Patton is an award-winning author and illustrator with more than twenty-five picture books and educational titles published internationally. She has a BA in Textile Design & Embroidery from Manchester Metropolitan University and an MA in Illustration from The University of Edinburgh. When not illustrating you will find her building tree houses, growing vegetables and hand making sketchbooks to fill with new stories, characters and adventures. She lives in Northumberland, England.